Charles Conder was born in London and spent time with his family in India, where his father was a railway engineer. Following his mother's death when he was five, Conder was cared for by a friend of hers and attended a boarding school at Eastbourne before moving to Australia in 1884. In Sydney he worked for the Lands Department and as a lithographic apprentice, supplying weekly drawings for the 'Sydney Illustrated News'. He and B E Minns attended Art Society School drawing classes with Julian Ashton, where he met A Henry Fullwood, Frank Mahony, Livingston Hopkins and Phil May. Conder also studied painting under A J Daplyn an adherent of plein-airism. He later met and was influenced by the Italian Girolamo Nerli and Tom Roberts. Conder, Roberts and Arthur Streeton who were major contributors with Conder to the famous '9 x 5 Impression Exhibition' in Melbourne in 1889. Conder returned to Europe in 1890 and established himself amongst artists of the fin de siecle in Paris and London. He became a friend of the French artist Louis Anquetin and the English artist William Rothenstein, who encouraged Conder to pursue lithography. The Balzac set refers to various characters in Honore de Balzac's novels which comprise 'La Comédie Humaine', this print in particular by one of them, 'Béatrix' (1838-41). 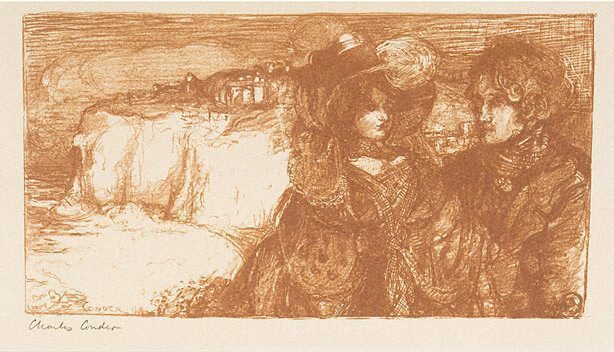 Signed l.l., carbon pencil "Charles Conder". Signed and dated on stone to print l.l. corner, "CONDER .99".